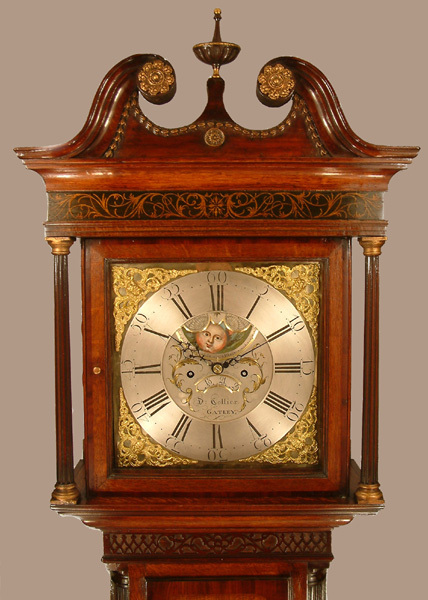 David Collier of Gatley Longcase Oak Circa 1760 - Height 87in. 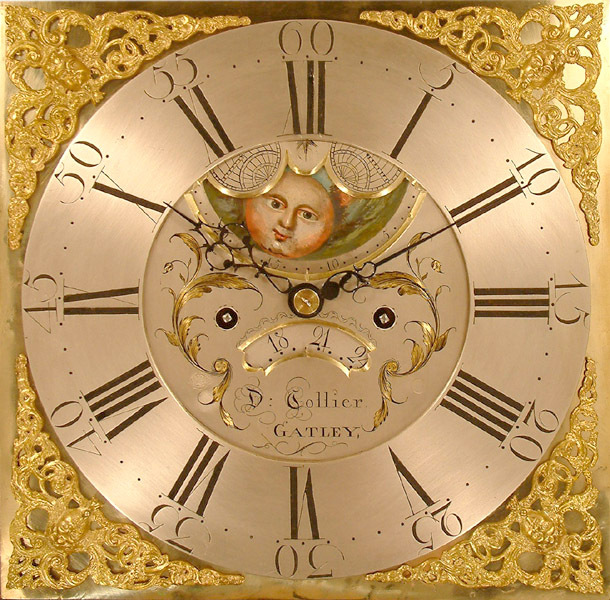 This Longcase Oak Archive's Maker - D. ( David ) Collier of Gatley ( Gatley Green, Manchester. Recorded born about 1721 worked at Gatley Green about 1750 - 62 then to Eccles where he died in 1792. Example with penny moon in Staircase House museum Stockport. ( Also supplied by me ). Really well proportioned, pretty, quarter sawn oak case with mahogany crossbanding and details, swan neck pediment, painted frieze, reeded quarter columns to trunk and reeded canted corners to base. 13" square brass dial with engraved & silvered centre featuring a well painted "axehead" moon and "sad mouth" date aperture. Blued cut steel hands. Well executed 4 pillar 8 day movement with hourly ( rack ) striking on a single bell. D. ( David ) Collier of Gatley ( Gatley Green, Manchester. Recorded born about 1721 worked at Gatley Green about 1750 - 62 then to Eccles where he died in 1792. Example with penny moon in Staircase House museum Stockport. ( Also supplied by me ). 87" ( 221 cms. ) or 85" ( 216 cms. ) ex finial.